A Talk on the Wild Side. If you pay careful attention to the birds this time of year, you may notice that some are carrying nesting material. Nests vary greatly across the country and different bird species have a number of unique techniques for building their perfect home to raise their young. Bald eagles build strong nests and use them year after year. They make improvements and add to the nest, it can weigh over a ton! The largest eagle nest was 20 feet deep and estimated to weigh 2 tons! >>Check out the nest on our eagle cam and watch them raise their chicks. Some birds will use abandoned homes from other animals. Burrowing owls have been known to use abandoned prairie dog burrows to raise young. Unlike eagles, great horned owls reuse nests built by other species and don’t make any improvements before moving in. It’s not unusual for their nests to collapse. Blue-gray gnatcatchers makes their nests out of spiderwebs and lichen - and they didn’t even take basket weaving in college! Ruby-throated hummingbirds have nests about the size of a thimble. Red-cockaded woodpecker nest in cavities that can take years to construct in a living tree. (But they sometimes have help.) They live in groups and will have as many as four helpers. Gyrfalcons can use theirs for generations- one was discovered to be over 2,500 years old. They use rocky ledges or old raven nests. Piping plovers make shallow depressions on the beach with a few twigs. Despite the lack of coverage, their nests can still be hard to spot because they are so well-camouflaged. What should you do if you find a bird nest? Many bird nests are protected by law this time of year, because they are considered “active”. Tampering with an active nest is against the law. An active nest is any nest where there are birds or eggs present. If you have a special situation where you must move the nest, you can apply for a permit but these are issued under very limited circumstances. 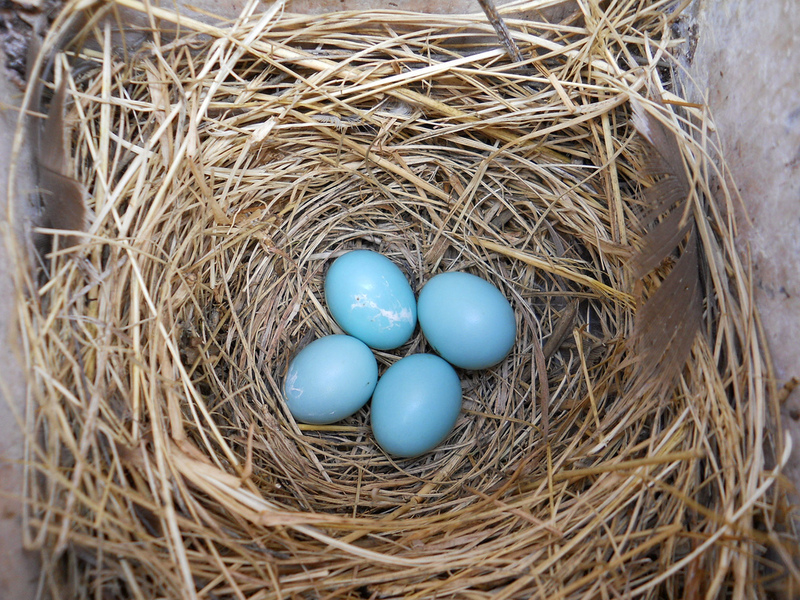 Some other interesting legal facts about bird nests? Bald and Golden eagle nests are always protected even when unoccupied. And it’s actually important that you get a permit to keep an unoccupied nest for educational purposes. By maintaining a respectful distance from the bird nests, we can help ensure that the birds will not be sensitive to disturbance since if they feel threatened they may even abandon young.We certainly don’t want to detract from the incubation process and we don’t want to interfere with them in their home. Yes I do absolutly LOVE birds. I believe they bring enjoyment & life to all. ?? What do you do when a bird makes its nest in the wreath on my front door? Use the back door and say Merry Christmas! The bird nesting in a wreath is probably a House Finch. Luckily they are very common and adaptable, and will happily move on when their young have fledged. In the future, take the wreath down before nesting begins in the spring and don't put it back until late summer. I have a metal rack standing against the back of my house( I was going to get rid of it until, I saw it held a nest of Robin eggs, recently , every year a Robin lays eggs in a nest on the rack. This year's babies are gone, painters are coming to paint the house soon: should the nest be placed elsewhere & hope momma will use it, since I want to do away with the rack? Inactive nests can be moved (but not kept), but active nests with eggs or chicks in them cannot be moved. In extraordinary circumstances a health and safety permit might be obtained from a regional permit office. I had a landlord throw away pigeon nests every year. Is that breaking the law? I tried to save the eggs but they never hatched. The rock pigeon, the bird commonly seen in cities around the United States, is not native, and it is not protected under the Migratory Bird Treaty Act. We had a robin build its nest in our wreath on the front door. We were able to watch the whole nesting, hatching, and fledging process. The kids loved it too.